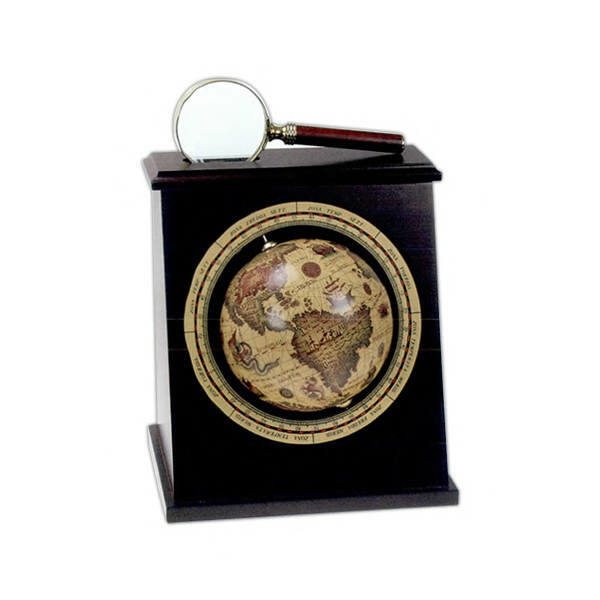 A wooden bookend with globe and magnifying glass in espresso brown finish. The magnifying glass rests within a small slot on top, while the globe is projected from the side of the bookend. The artwork on the globe itself is cast in a weathered, age-old style that gives it a distinct feeling and appearance. Globe is rotatable. Only one end/side of the bookend. Size: 6 1/4 " x 4 1/2 " x 7 "